We all want beautiful homes or buildings and interior designers play an important role in achieving this. Having that modern kitchen island, sleek windows, stylish and glossy finishing or that minimalist design simply makes a home feel more complete and comfortable. Be it a brand new home renovation or a home makeover, interior designers are needed to help home owners improve their precious homes. This probably explains why the interior and architecture industry has been growing over the years. Running a business in Singapore is no easy feat and requires a huge amount of funding. At SBL Singapore, we understand the costs needed to run a business and to remain competitive. Providing products of good quality and differentiating from competitors is important. Our goal is to help businesses in Singapore, no matter the size grow. If you require financial help for your business, do not worry as SBL Singapore offers affordable business loans to lend you a hand. Recently, SBL Singapore assisted Mr Kwok Jia Lun who runs his interior design company in Balestier. Mr Kwok graduated with a Degree in Designing from Netherlands and on returning to Singapore, started the business with a few good friends. However, after running the company for a year, Mr Kwok found it difficult to manage business funds as most of the projects are only paid after completion. He needed more funds to purchase materials and to hire manpower for the jobs. The interior designer was in a financial pinch and needed help. Luckily, SBL Singapore stepped in and lent the local designer a helping hand. We provided him with the necessary funding for his business and he was able to make all the payments, carry through all projects and even gained more clients. Today, Mr Kwok’s interior design company is doing well with plans of expanding and hiring more designers. Launched in February 2018, SBL Singapore aims to provide greater financing and funding to all local businesses, no matter the size. Other than funding, SBL also gathers many mentors in the architecture and design industry through our Coach-and-Go programme to help local businesses grow and enter the overseas market. 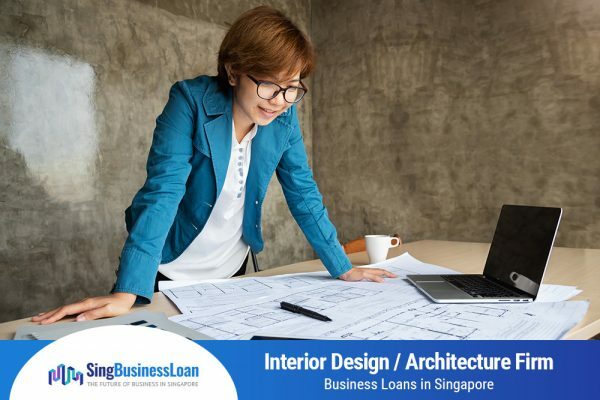 With an Interior Design / Architecture Firm Business Loan, you pay for an inexpensive and reasonable rate of interest on regular monthly settlements. This leaves you with enough capital and funds to remain competitive and better your business. Also, you will receive the mentor-ship assistance and operation assistance that you require.